Vice President Pence says US embassy to be relocated to Jerusalem by end of next year. Vice President Mike Pence announced Monday that the US embassy in Israel would be relocated to Jerusalem by the end of next year, fulfilling President Donald Trump’s campaign promise in 2016 and implementing orders issued by the president last month to the US State Department. 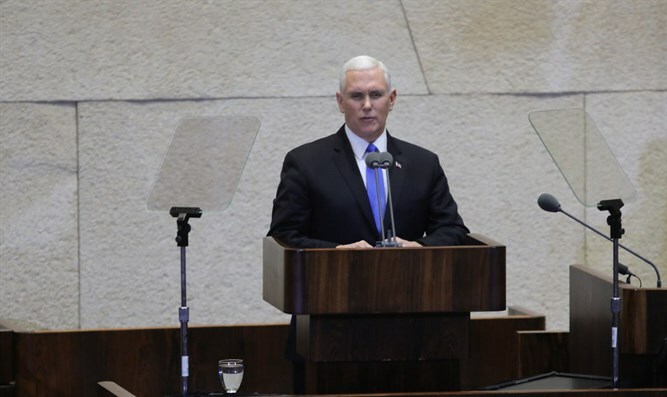 During his address to the Knesset Monday afternoon, Pence said that the Trump administration was committed to moving the US embassy from Tel Aviv, and that the new embassy would be opened up before the end of 2019. The Vice President did not, however, provide any details as to the location of the new embassy or a precise date. "In the weeks ahead, our administration will advance its plan to open the U.S. Embassy in Jerusalem – and that United States Embassy will open before the end of next year," said Pence. Pence arrived in Israel Sunday evening, kicking off a three-day visit of the Jewish state, accompanied by his wife, Karen. The trip is the first visit by Pence to Israel since he took office in January, 2017. The Vice President, who was originally slated to visit Israel on December 18th, had planned to meet with Palestinian Authority chairman Mahmoud Abbas. Following President Donald Trump’s December 6th declaration recognizing Jerusalem as Israel’s capital, however, the PA announced that Pence, as a senior figure in the Trump administration, was persona non-grata in the PA.